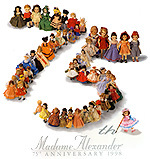 2011 Update - We do not have any Madame Alexander dolls in stock at this time. kmalone@dollery.com to get updated inventory information. You can also call 800-447-3655 out of state or 781-447-6677 in Ma. This page is here for reference only.